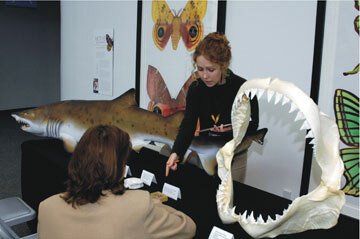 As a class assignment, University of Florida graduate students observed visitors’ reactions to, and comments about, a fossil shark display at the Florida Museum of Natural History. Photograph is by John Jernigan, FLMNH. 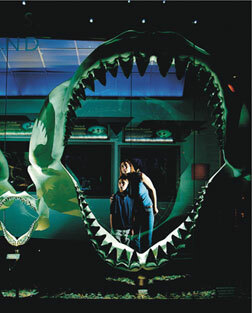 As the result of a student project conducted last year at the University of Florida, this summer, kids will walk through the jaws and belly of an 18-meter-long extinct Megalodon, look up in wonder, and perhaps begin to understand the importance of the geosciences. Traditionally, geoscience students have had few opportunities to engage in these kinds of public outreach projects as part of their formal education. Nevertheless, their participation in broader impact activities can improve public understanding of science in the immediate future and advance professional development of these young geoscientists. Climate change, natural disasters and evolution are examples of geoscience-related issues making headlines today. While these topics should concern society, the general public often poorly understands how and why these phenomenona occur and can have a difficult time understanding how science is done. It is thus crucial that as geoscientists we not only communicate our scientific discoveries, but also the process and results of our science to society at large. This can be done through “broader impact” activities, such as K-12 outreach, museum and web-based exhibits, and various other media. To increase graduate students’ awareness of the importance of communicating science to society beyond the figurative ivory tower, Bruce MacFadden recently taught a seminar at the University of Florida entitled “Broader Impacts of Natural Science on Society.” MacFadden designed the course around the variety of ways to effectively communicate science. The class involved several main components, including: how students should select which journals to publish in; funding considerations, including how to get grants and what is expected once one is received (including the all-important broader impacts); and the public eye — how to impact the greater society. The class began with big-picture discussions about “curiosity” versus “strategic” science — essentially the difference between doing science because you think it is interesting, or doing science that fits into a larger context. To understand the importance of relevance, we discussed the late Senator William Proxmire’s “golden fleece awards,” which highlighted projects during the 1970s and 1980s that were considered by some members of Congress to be of dubious importance and benefit to society. We also spent some time discussing the landscape at the National Science Foundation (NSF), including broader impact components of research grants in the geosciences and the Communicating Research to Public Audiences (CRPA) program of supplemental grants funded by NSF (which provides up to $75,000 in support of projects that communicate the results of currently funded NSF research to society). Then came the fun part of the course — the discussion about formal and informal educational outreach programs, particularly involving museum outreach. We discussed citizen scientist programs, such as volunteers at fossil digs, commercialism in paleontology — including the sale of fossils on the Internet — and the communication of science through paleoart. Larisa DeSantis administers a “front-end survey” about a proposed fossil shark exhibit at the Florida Museum of Natural History. Photograph is by Jeff Gage, FLMNH. With this background behind us, we transitioned to conducting our own outreach program. After guest lectures by our museum’s education and exhibits professionals and brainstorming, the class set off to get their feet wet in museum outreach by gathering the necessary background to develop a shark exhibit to complement MacFadden’s currently funded NSF research. A first step to developing an exhibit can include unobtrusively observing visitors in the museum to learn about their preferences, interests and knowledge base. Each student spent a few hours at the Florida Museum of Natural History’s exhibit on fossil and modern shark jaws, listening to comments made by museum visitors and noting their questions, conversations and misconceptions. Once the students had this initial background, they developed a front-end evaluation, in the form of a survey-interview that they administered to 104 museum visitors to determine the actual level of interest in, and knowledge about, a proposed shark exhibit. As the survey results indicated a high level of interest in a shark exhibit, MacFadden and the class ran with it, ultimately developing an exhibit as part of the CRPA proposal, which was recently funded. Because this outreach program actually had a practical purpose, the students got additional practical experience as well, and since the conclusion of the course, a couple of graduate students have remained involved in the project and continue to participate in the exhibit’s development (see sidebar). They are in the midst of collaboratively developing a large traveling shark exhibit entitled “Megalodon,” that includes a dramatic 18-meter-long walk through a model of the largest shark that ever lived. Like their mentors, young professional geoscientists can greatly benefit from increased awareness of the importance of broader impact activities that effectively promote and communicate science. Graduate seminar courses like the one taught at the University of Florida can facilitate learning about both the importance of broader impacts and provide practical experiences in which students can engage the general public about current geoscience research. As a graduate student in paleoecology, I have often felt as if I have been in the middle of a tug-of-war with education on one side and science on the other. If I chose to engage in educational outreach activities during my graduate career, I felt that my research would consequently receive less attention. Could scientists both conduct innovative research and communicate their science to society? I soon realized that other graduate students were also trying to figure out how to achieve a necessary balance between research and public outreach. Today, I continue my involvement in exhibit planning as a member of the Megalodon exhibit committee. With unique opportunities to write exhibit text, develop hands-on inquiry-based activities, and create accompanying educational material for the traveling exhibit, I am constantly thinking of new ways to communicate science in a captivating fashion. While I am enthusiastic about the process of exhibit development, I can’t wait until opening day when I hope young children will be inspired to engage in the sciences. And for us, we are now equipped to communicate science in a charismatic way that is fun for visitors of all ages. Participating in outreach that directly extends from current research has been a valued opportunity that I hope all graduate students have the chance to experience — and hopefully something we will all continue with as young professionals. Bruce MacFadden is a curator at the Florida Museum of Natural History at the University of Florida. E-mail: bmacfadd@flmnh.ufl.edu. Larisa R. G. DeSantis is a Ph.D. student studying paleoecology at the University of Florida. This article describes projects funded by NSF Earth Sciences (EAR 0418042) and informal science education (ESI 0638810).